I love the holiday season, but let me tell you that it is also an incredibly stressful time. There are so many expenses that come along with the holidays, and how I hate having to worry about everything being so expensive! Thankfully there are something things in life that don't cost all that much and a lot of those things are the best things! Take family & friends and the opportunity to spend extra time with them during the holidays. Also the time off the kids get from school and that we get to spend together as a family. This is going to be a very special year for us because all of the small children are here and the girls and I are going to do our very best to try to make it really special for all of them. We are also very thankful for our extended family and friends, who will not be near us but who are always in our thoughts. Thanks to Unlimited Talk Text and Data/Web we will be able to stay in touch with all those special people via phone calls, texts and social media updates. This is where our phone service is invaluable to us, and we are still using Wal-Mart's Family Mobile plan which is only $34.88 a month and the only reason that all of us are able to have a line without having to stress the bill. This year I really want to be able to get all four of the girls a nice upgrade, and I went to Walmart to see what I could find for them that will be nice, BUT in my budget. Jack is the only one of the girls that works and uses her phone for work, so I really wanted to find her something extra special. The ZMAX Phablet was the perfect choice for her and today was her day off so I went ahead and gave it to her early. I wanted to see her face when she saw how big this phone is! Feast your eyes on this beauty! The ZMAX Phablet is an oversized cell phone for the person that uses their phone for everything. Not only does this beauty have a super large screen for games, Netflix and all of her work things, but it has an 8 megapixel camera! We take tons and tons of photos, especially of the kids. This phone will allow her to leave the big camera at home and use it for her day-to-day picture taking. The ZMAX Phablet was on sale for $199.88, which is a very nice price when you compare it to some of the phones out there right now, and with Family Mobile there is no contract! That right there is the reason that I joined this service after years of struggling with a contract service. I said goodbye to overage fees, limited data/minutes and the rest of the hassles that come with contracts. With Family Mobile all my girls have a small bill that they each pay and we don't have to fight about the big bill at the end of the month. Instead we can concentrate on enjoying our phone calls, movies and unlimited texting. These girls are 19,20,22 and 24 and 7, can you just imagine how much data and texts they use? Thank goodness we have unlimited! 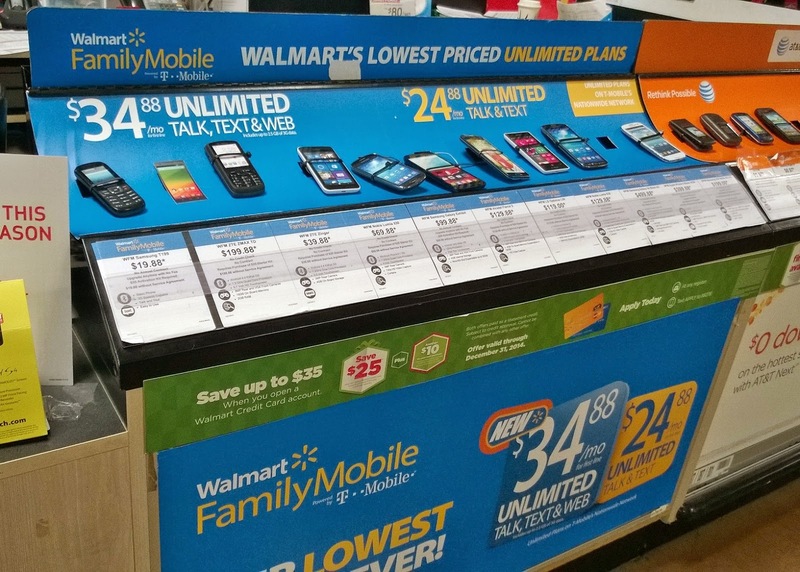 Head on over to Walmart and check out the Family Mobile plan for yourself. Pick a phone and grab the $25 starter kit and you will be on your way to being thankful for a smaller bill too. This November I am thankful for so many things. Instead of stressing the expenses, I am going to concentrate on all of the positives. I can't wait to do all of the shopping for everyone too, that's always a lot of fun for me. It will be so nice to give the other girls a nice upgrade and give the kids all kinds of toys! The holidays are a very special time of the year and I am thankful for the opportunity to make it really great for my family.